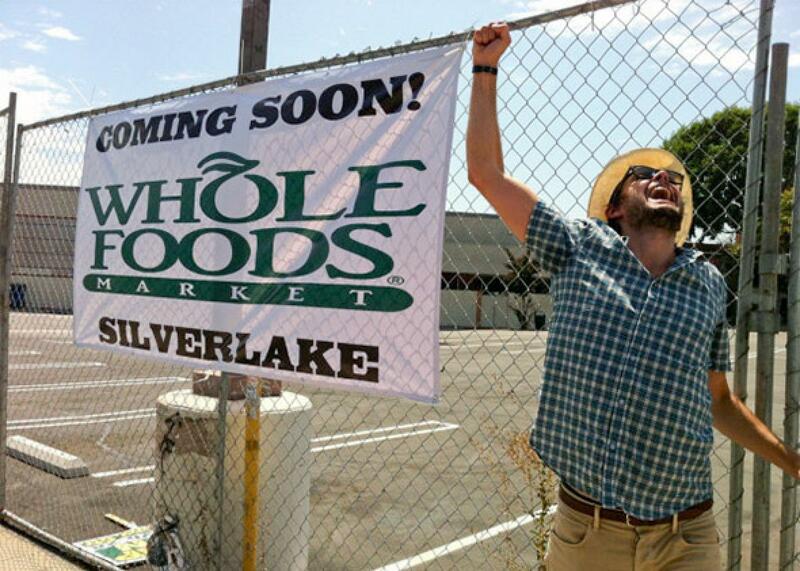 Whole Foods 365 in L.A.: Why are Silver Lake residents outraged over a grocery store concept? Why bougie L.A. residents are outraged over Whole Foods’ new budget grocery store. First time farce, second time tragedy: in 2011 a “Coming Soon! Whole Foods” banner hung in front of a defunct Circuit City in Silver Lake was nothing more than a hoax to rile up hipsters. In 2015, consternation centers on the soon-to-be-real Whole Foods not being fancy enough. Photo courtesy Nick Thune. Banner made and hung by Brendon Walsh. Hell hath no fury like an upscale urbanite who’s been promised a Whole Foods only to see it yanked away. That’s got to hurt. But this is much more than a silly neighborhood dispute over what seems like the ultimate first-world problem. The outcry offers lessons in everything from how not to manage public relations (Whole Foods, I’m looking at you) to the promise and perils of marketing to millennials to, finally, what happens when people come to define themselves according to where they shop only to discover that corporate behemoths don’t necessarily reciprocate their love. But what should Whole Foods have expected? Many in Silver Lake, once a rapidly gentrifying and now increasingly wealthy neighborhood frequently compared to Brooklyn’s Williamsburg (which is scheduled to get its own Whole Foods next year), have long complained about their shopping options. Even as hip, nationally famed restaurants have proliferated—and even as people line up for $5 cups of espresso at the area’s Intelligentsia outpost—residents say the area supermarkets, with the exception of a Trader Joe’s, continue to feel like stepping into a 1990s time warp. As a result, when comedian Brendon Walsh placed a “Coming Soon! Whole Foods” sign in 2011 at the site of a closed Circuit City in the neighborhood, Silver Lake Twitter erupted in celebration before people realized it was a prank. Then it was real. Whole Foods announced in 2013 it was taking over a more-than-50,000-square-foot Ralph’s supermarket. While a few bemoaned the loss of a general supermarket that served all those who lived in the neighborhood, including long-established immigrant communities, others were thrilled. Some realtors began to include phrases like “located near the upcoming Whole Foods” in their listings. L.A. Weekly predicted the site’s “parking lot isn’t anywhere near big enough” for the expected hordes. Store officials even presented a plan to offer a wine bar and café at the location. And then … 365 by Whole Foods Market. This time a comedian hadn’t punked Whole Foods’ fan base. It was the company itself, which the more vociferous residents seemed to believe had pulled a bait and switch. You don’t need me to tell you that punking your customers is a bad idea, even if said punking only involves a swap of grocery-store concepts. Whole Foods then compounded the situation with less-than-forthcoming communication. Would there be a butcher? A baker? A cheesemonger? They won’t tell. “We aren’t ready to share specific details about department offerings just yet,” Marci Frumkin, an executive marketing coordinator for the store, told me via email last week. You would think a company recently outed for overcharging customers for prepared foods like pecan panko and coconut shrimp as well as attempting to pass off three asparagus stalks in a $5.99 bottle of water as “asparagus water” would realize the equivalent of “just trust us” isn’t the right response. You would be wrong. The problem is basic. Once an upstart, Whole Foods is now so successful that it’s spawned its own competitors. A decade ago, organic and other food like gluten-free items were considered specialty products. Whole Foods could charge high prices, because many of their customers were choosing between Whole Foods and … Whole Foods. Now Walmart carries the organic Wild Oats line of food. As many marketers note, brand loyalty isn’t what it used to be. This is particularly true for millennials, who are under enormous economic stress, paying down student loans and still finding it hard to get a stable footing in the workforce in the aftermath of the Great Recession. So, yes, they “are twice as likely to care about organic food than non-Millennials,” as a 2012 survey entitled Millennial Passions by the Boston Consulting Group put it, but they also prize efficiency, quickness, pocketbook-friendly prices, and transparency. The practical result? They say they would like to shop at Whole Foods, but their pocketbooks often cause them to turn to discounters instead. All this has taken a chunk out of Whole Food’ prospects, where sales at stores open at least a year are now all but stagnant. In an attempt to reverse its fortunes, Whole Foods wants to meet the young ones where they live, both geographically and budgetwise, planning to also open their 365 stores in Santa Monica, California; Houston; Portland, Oregon; and Bellevue, Washington. And plenty of millennials do live in Silver Lake and adjacent, even hipper neighborhoods like Echo Park and Atwater Village, where they are rapidly replacing lower-income and working-class residents who often relied on stores like Ralph’s. But plenty of middle-aged people live in these neighborhoods too—people who, like Whole Foods, were once bohemian upstarts but are now a bit older and more settled. They faithfully drove through Los Angeles traffic—perhaps with howling toddlers in tow—to shop at Whole Foods in other neighborhoods, waiting patiently for their turn to come, only to discover they had been tossed aside for a younger model. Silver Lake is not the first nor likely the last enclave where residents are literally begging for a Whole Foods. Online petitions asking for stores frequently read like crosses between market research reports, sales pitches, and letters from spurned would-be lovers. “Between the families, the young professionals, long-time residents and university students in the neighborhood, we have more than enough demand to satisfy Whole Foods,” went one 2013 plea out of Washington, D.C. As for White, her missive told the organic superstore that it was “wholly wrong” about who lived in the neighborhood. “Residents of this neighborhood can afford this,” she added. In a world where all too many people define themselves by what they can afford to purchase and do actually buy, Whole Foods gives the sort of person David Brooks so memorably labeled bobos, short for bourgeois bohemians, validation, not to mention a bit of convenience in a busy life. It endorses that decision to drop more than $800,000 on a tiny two-bedroom Spanish or craftsman bungalow with a Viking stove or a Brooklyn brownstone that’s located near a Superfund site. A local Whole Foods is a stamp of approval from the United States’ greater corporate culture, but one that at the same time allows the people who crave it to still believe they remain just a bit outside the mainstream. Silver Lake consumers were led to believe they had received the all-important nod from Whole Foods—only to see it snatched away. No wonder they’re enraged.